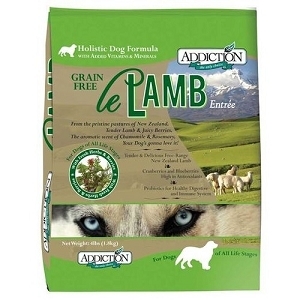 Addiction's Salmon Bleu Grain Free Dry Dog food includes a balance of natural anti-oxidants as well as Omega-3, a fatty acid that dogs require to prevent inflammation but cannot create themselves. Featuring Pacific Salmon from the bluest oceans, Addiction's Salmon Bleu is a hypoallergenic diet with an optimal balance of essential nutrients. 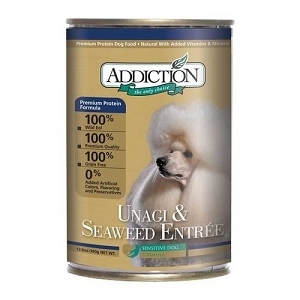 High in Omega 3 fatty acids and natural antioxidants, this premium grain-free diet with smoked salmon makes a delicious, gourmet meal and is ideal for dogs of all life stages. Addiction's Salmon Bleu is made with Pacific Salmon, which has high levels of Omega 3 fatty acids. Omega 3 fatty acids have been shown to contribute to skin and coat health. Salmon Bleu uses only the finest Pacific Salmon and is an ideal premium protein for dog owners seeking alternatives to chicken, beef or lamb. This unique formula includes delicious Smoked Salmon packed with Vitamin A and Carotenoids, for a scrumptious flavor your dogs will love! Cranberries, Blueberries and Raspberries have higher levels of antioxidants compared to many other fruits and vegetables. Cranberries and Blueberries also contain phytochemicals and flavonoids beneficial for health. 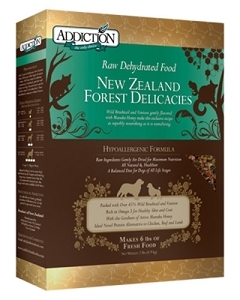 They are naturally sweet yet low in fat, making a nutritious tasty supplement to this product. 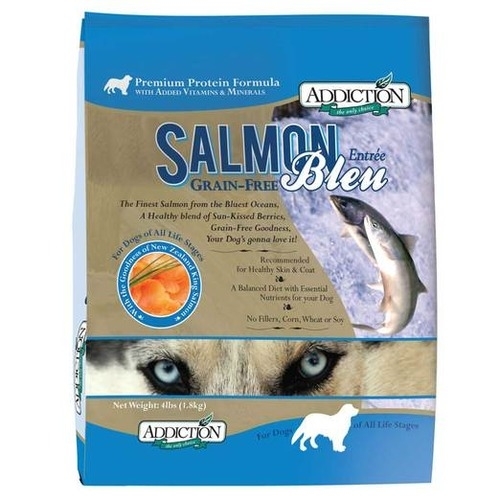 Addiction’s Salmon Bleu is formulated to meet the nutritional levels established by the AAFCO Dog Food Nutrient Profiles for all life stages. Recommended by Dr Lye of Animal Recovery Clinic. PP has a natural allergic reaction to wheat/grain. Have tried other brands of food without wheat/grain but only this works. Might be a lil expensive but its worth the money and guess tastes yummy with boiled carrot. Do get the flaxseed oil and add it in for better health and shiny coat.